With Thanksgiving fast approaching, I’m once again reminded of the many blessings I’m grateful to have in my life. With each of us facing our own personal struggles—some more outwardly visible than others—it can be easy to lose sight of the opportunities that surround us. As such, Thanksgiving is always a welcome moment for me to pause and reflect on the year. This second year as your Secretary of State has been filled with amazing progress. I could not be more proud of my team and the work we’ve accomplished on behalf of Oregonians so far this year. I’m thankful to the Elections Division team, who successfully administered three smooth, safe, and secure elections since January —especially the midterm November General Election, which had the second highest number of ballots cast in Oregon history. 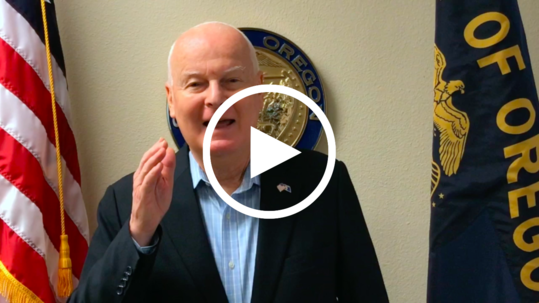 Our office also pioneered a number of voter engagement efforts, including a first-of-its-kind outreach to Oregon inactive voters through Facebook. I’m thankful for the award-winning work of the Audits Division. Among their accomplishments, they drew much-needed attention to major deficiencies in Oregon’s Foster Care system and Air Quality Program, diligently identified over $106 million of wasteful spending by Oregon government, and have been recognized twice in hearings on Capitol Hill by the US Comptroller General. Meanwhile, the Corporations Division generated more than $72 million to be used for education, social programs, and other legislative expenditures. The Office of Small Business Assistance has doubled the number of small businesses and entrepreneurs they helped start a business and successfully navigate the state bureaucracy and red tape. They also hosted the United States Ombudsman Association Conference in Portland with attendees from around the world. I’m thankful to members of the Archives Division for their incredible work with the first-of-its-kind “Black in Oregon, 1840-1870” exhibit, sharing the stories of African-American pioneers in Oregon. They also oversee the extremely popular Oregon’s Kid Governor program. Oregon’s first Kid Governor, Dom Peters, was inaugurated this past January and has had quite a productive year working to stop bullying and promote kindness in schools. Dom’s successor, Erikka Baldwin, just recently won the 2019 Oregon’s Kid Governor election on a platform of finding forever homes for Oregon’s not-yet-adopted cats and dogs. Working behind the scenes to enable all these successes is the team in the Administrative Services Division. They are setting an example for the rest of the state by recognizing our veterans, strategic management of successful IT projects, training and hiring of team members, and unparalleled transparency of all agency spending. These are only a sampling of the many accomplishments our team of skilled professionals achieved this year—there are simply too many to list here. I can never thank the dedicated civil servants enough who comprise the Secretary of State office. Without them, we would not be able to complete this great work for Oregon. I'm forever thankful for my wife Cathy, my children, and my faith. The most precious moments of my life continue to be centered on them, and I wonder every day how I could have been so fortunate to be so blessed. Lastly, I'm thankful for you, the people of Oregon. Thank you for entrusting me with the responsibility of being your Secretary of State. I will continue to honor you by working hard to bring accountability, transparency, and integrity to your state government while striving to make “liberty and justice for all” a reality for every Oregonian.